It is not free energy; it ONLY saves UP TO 70% of the energy comparing with traditional ones ! When the prices of solar batteries and panels come down, the existing HI-POWER LED street lamps do not need to be replaced ! YOUR CITY & YOUR COUNTRY ! ! ! The degree of illumination suggested is based on the height of lamp post to reach the best effect. ■ It is made by high-pressure aluminum die casting . - is able to take advantage of natural wind, rain or dew to cool and disperse heat quickly. ■ Temperature of lamp chamber is kept below 50°C (approximately 40°±5) to ensure the long life span of high- wattage & high-power LED chips and long-time using. ■ Adoption of high reflection effect of Industrial PC & Nano-electroplating to double the illumination. ■ Lampshade: anti-ultraviolet rays, collision-resistance, high perviousness to light, Industrial plastic PC material, Acid-resistance, durability, anti-rain, water-proof silicon rubber rings. ■ To ensure that any set of power damage do not cause total illumination of a lamp to fail. ■ Hi-power LED has automatic power switch ranges from 110V to 260V. The illumination of one unit of our Hi-power LED is approximately 1.4W. 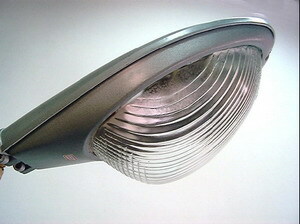 It is designed that 12 units of Hi-power LED to share one power supply device for illumination. 168W = 14 sets of power supply. This is designed is to avoid possible damage to a single set of power supply causing failure of total illuminationof a lamp. Replacement of damaged power supply is solely for the set (s) that fails. ■ Hi-power LED lamp can help save 70% of power consumption. If it is 100 Million US Dollars for a city’s annual electricity power consumption with traditional street lamps, Hi-power LED street lamp can help save 70 Million per year. ■ Take “8M high lamp post with LED 168W illumination” for example. With AC 200V electricity output, the consumption per hour is 0.76A/168W, while normal electricity power consumption of 400W street lamp is 2.4A/ 400W with the starting current 3.5A, which wastes much electricity. ■ 3 years, approximately 13,000 hours, under normal use and excluding natural disasters and any other cause that is not related to the design and quality of product itself. It is made by high-pressure aluminum die casting with polyester electrostatic surface coating. The imported high-purity aluminum reflecting lamp shade is made through positive anti-oxidization process. It is manufactured through intensified process, which is acid-resistant, durable, anti-rain with water-proof silicon rubber rings. Hi-power LED lamp can help save 70% of power output. If it is 100 Million US Dollars for a city’s annual electricity power consumption with traditional street lamps, Hi-power LED street lamp can help save 70 Million per year. Take “8M high lamp post with LED 168W illumination” for example. With AC 200V electricity output, the consumption per hour is 0.76A/168W, while normal electricity power consumption of 400W street lamp is 2.4A/ 400W with the starting current 3.5A, which wastes much electricity. 3 years, approximately 13,000 hours, under normal use and excluding natural disasters and any other cause that is not related to the design and quality of product itself. Locations: Sea ports, plazas, parks, alleys, streets, roads, high ways, freeways, parking lots, communities, etc. Main Judgment: the height of lamp post, width of road. Auxiliary Judgments: , location, lanes of the road, setting of the lamp posts, setting of traffic/safety island (if any), etc. C. Lighting Time: 6:00 pm ~ 6:00 am (per day), continuous 12 hours.